With 30 June around the corner, now’s the time to start planning for the new financial year and move to the cloud with QuickBooks Online. One of the first things to consider is whether you are registered for GST. If you are, here are some handy tips. If you’re not registered for GST, DO NOT set up GST in the GST centre from the left-hand-side navigation bar. This will save you a great deal of time having to enter the Out of Scope (No GST Reportable) GST code for all transactions. If you have set up GST and you are not registered, you can default the code from the company preferences to OOS (Out of Scope). From the Gear Icon, click Settings, then Company Settings, then Advanced, and then Default tax rate selection. GST needs to be set up correctly from the initial set-up. If you’re unsure, ask a BAS agent or your accountant. I’ve seen many set-ups of GST that have ended up with BAS underpayments as the GST method was set as either Accrual or Cash incorrectly. Ensure all your bank and credit card accounts have been reconciled. EVERY business expense, payment, sales payments, sales receipts, cash expense, payment and sale should be posted in QuickBooks Online for the BAS period. If this has not been completed, you will not pick up all the correct business transactions that you can claim and you may miss out on credits on your BAS. This is especially important if you are on the Accruals GST method. This also means you could miss out on payments for your services and on GST collected and you will have to pay this back at some point. 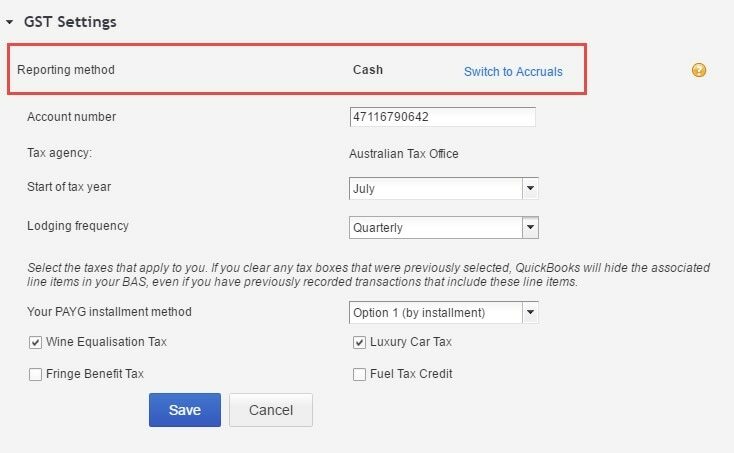 Upon completing your BAS in QuickBooks Online, remember to click the Mark as Lodged button in the ‘Completing a BAS worksheet’ window. This will save a snapshot of your lodgement and generate a journal to reduce the BAS liabilities account in the Balance Sheet and moves the amount to be paid or refunded into the BAS Suspense account. This will also close the BAS period and any changes made to the transactions from this period, and prior periods that are changed later will be shown in the GST exception report. The transactions in the exemption report are then shown in your next BAS period in the Complete BAS worksheet under the Exception Amount. They will be added or subtracted to the GST on Sales or GST on purchases amount and will be reflected on the bottom figure of Refund or payment due. These figures should be reported to the ATO for this new BAS period. Instalment Activity Statement – Monthly reporting for PAYG. FYI: W1 and W2 refer to fields within the BAS Statement, the term is quite familiar to any GST registered business. QuickBooks Online will push through these figures and if BAS is run each quarter, this will have the total amounts in both W1 and W2 for the entire quarter. One way you can reduce these is to go into the journals that are produced for the payruns for the previous two months and change from W1 and W2 to Out of Scope (Purchases). Set up a recurring transaction for your monthly IAS payments for the end of the month. That way they will reduce the PAYG withheld account in the Balance Sheet at month’s end and increase the BAS suspense. Then when the payment is made from a bank account, pay this to the BAS Suspense by clicking the Create button, then Other, and then Transfer. GST can be easy to manage, but it can also be a huge challenge if not set up correctly. It is all in the set-up and processes you take. If you are unsure, contact a trusted BAS agent or accountant who will be able to set everything up from day one and also train you.